We check over 450 stores daily and we last saw this product for £436 at Barneys New York. 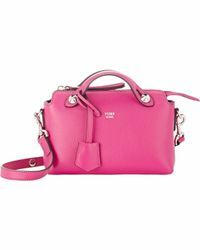 This Mini By The Way red cross-body bag from Fendi will add a contemporary edge to your look. Crafted from leather, this design features sleek silver-toned hardware and a logo stamp to add signature polish. The flat straps on the sides are perfect for sliding over your hand and carrying this compact bag as a chic clutch, or use them as top handles for a sophisticated satchel-inspired style.